Diffuse band of light crossing the night sky. Greek: Galaxias kuklos = "Milky Band"
Latin: Via Lactea = "Road of Milk"
Galileo observed the Milky Way with his new telescope. "For the Galaxy is nothing else than a congeries of innumerable stars distributed in clusters." This was the first observation that showed that the Milky Way was simply made of many many unresolved faint stars. Wright made no new observations. Milky Way is a thin spherical shell of stars. The Sun is located inside the shell about midway between the inner and outer edges. Misread a newspaper account of Wright's model. Also made no observations of his own. Lens-shaped disk of stars rotating about its center. No special place for the Sun. Other "nebulae" are distant, rotating milky ways like ours. Later became known as the "Island Universe" Hypothesis (term coined by Alexander von Humboldt, Kosmos, 1845). Counted stars along 683 lines of sight using their 20-foot long, 19-inch diameter telescope. Assumed that stars are uniformly distributed through space, and do not extend beyond the edges of the Milky Way. Assumed that their telescope could resolve all stars within the boundaries of the Milky Way. Contrary to some accounts (including your textbook! ), Herschel did not need to assume that all stars are the same luminosity for his Star Gage method to work. He did make this assumption in other work, however, hence the confusion by some (copying the same mistake from each other?). Sun located very near the center. The Milky Way Map of William Herschel. Click to see a larger version. Figure 4 from On the Construction of the Heavens by William Herschel, published in Philosophical Transactions of the Royal Society of London , Vol. 75 (1785), pp. 213-266. Image scanned by the author. 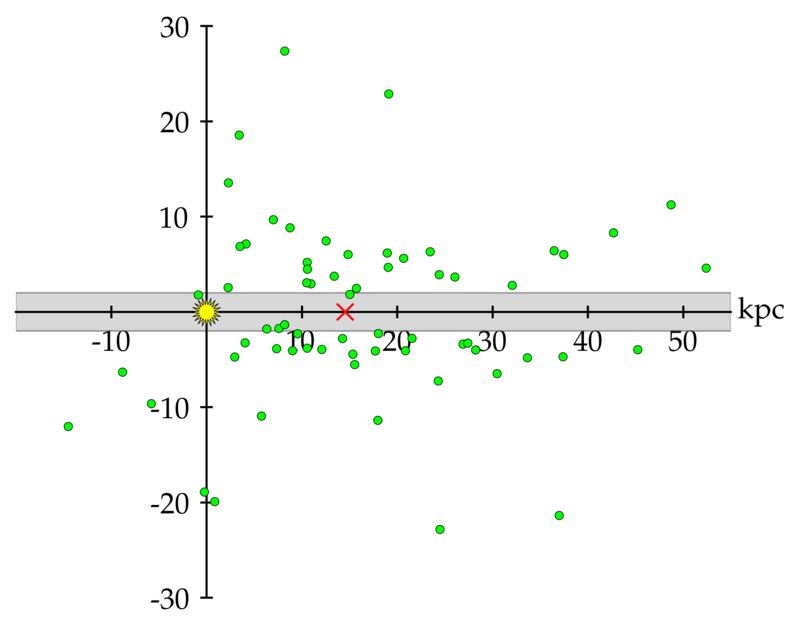 Estimated distances statistically based on parallaxes & proper motions of nearby stars. Neglected interstellar absorption of starlight (assumes that stars were faint only because they far away, not because interstellar absorption blocks some of the light). The Sun is located slightly off-center. Sketch based on Kapteyn's paper. Astronomer at the Harvard College Observatory who was working on the nature of Globular Clusters of Stars. They are uniformly distributed above & below the plane of the Milky Way. They are concentrated on the sky toward the direction of the constellation of Sagittarius, where the Milky Way appears brightest. Estimated Globular Cluster distances from observations of their RR Lyrae stars and their magnitudes and diameters. Used these distances to map the globular cluster distribution in space. 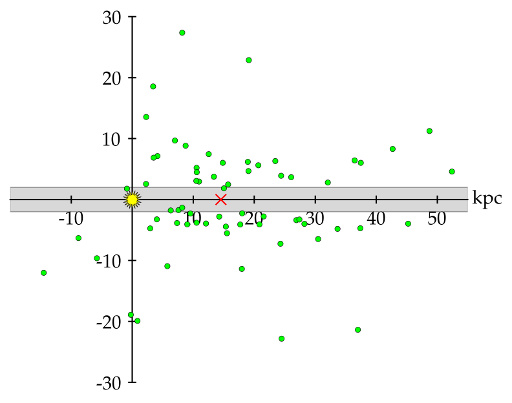 Graph based on Shapley's original 1918 globular cluster data. 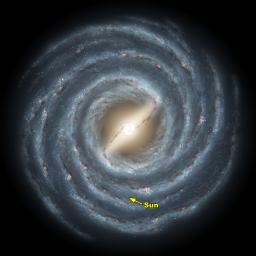 The Sun is located at the center of the axes as the yellow sun symbol, and the center of the Milky Way inferred from the distribution of globular clusters is marked by the red X at about 15kpc from the Sun. The gray horizontal band is a region of obscuration noted by Shapley. Globular clusters form a subsystem centered on the Milky Way. The Sun is ~15 kpc from the MW center. Caused him to overestimate the distances. This makes more distant objects look fainter than they otherwise would be if there were no interstellar dust. If left unaccounted for, it can lead to serious overestimates of Luminosity Distances. Shapley & Kapteyn thought it was smaller than it actually is, and so overestimated the size of the Milky Way. Robert Trumpler (1930) showed that interstellar dust absorption was significant. A flattened disk of stars with a central bulge. The disk is ~30 kpc in diameter and ~1 kpc thick at the location of the Sun. The Galactic Center and much of the disk of our Galaxy is obscured by interstellar dust in the plane of the Galaxy.